Immersed in a session of Youtube nostalgia recently, I got to pondering my ambivalent attitude toward "rock." Many of the videos over which my sweetie and I were reminiscing were fun pop-rock from our high-school years. I no longer own any of this music, but I admit enjoying it. And while I listen to almost no current pop and rock, every once in a while a song comes along with an irresistible melody or hook and I can't help a moment of indulgent enjoyment. Which got me thinking about global rock. I've done only one radio show focusing on this little sub-genre, back in 2002 and featuring the likes of Yat-Kha, Brothers of the Baladi, Manu Chao, Le Tetes Brulees, and others. Perhaps I largely avoid "world rock" for the same reason I generally avoid other global versions of "Western" popular music such as pop, R&B, funk, and hip-hop. Too often it comes off sounding derivative or simply a rootless reproduction of what happens to be popular. Yet ... as with that 2002 show there are artists who can rock while maintaining a sense of place. I recently pulled out the great album From Heaven into Hell by Revelling Crooks, who mix a Celtic-punk sensibility with Gypsy and Jewish songs. Of course Celtic rock and punk abounds from others, including Boiled in Lead, Wolfstone, Flogging Molly, Enter the Haggis, Great Big Sea, the Pogues... I could go on, but you get the drift, yes? 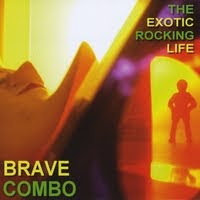 For reasons I won't even attempt to fully explain, one of my favorite rockin' global bands has to be Brave Combo. Yes, those lads from Denton, Texas, who perhaps are more known for their quirky cover songs (many in a polka vibe) can also lay down a wall of guitars and machine-gun drumming. I'm thinking specifically of this song, which they describe as "a Greek dance ... usually enjoyed by men only, the night before going to war." Don't get this album expecting an all-rock affair. While they do have a grinding mashup of spy tunes called "Undercover Medley," much of the album has a decidedly Latin flavor, including the "Mission Impossible" theme as a cumbia and the "Louie Louie" cha-cha. I'll vote them "Band Least Likely to Get Stuck in a Rut."